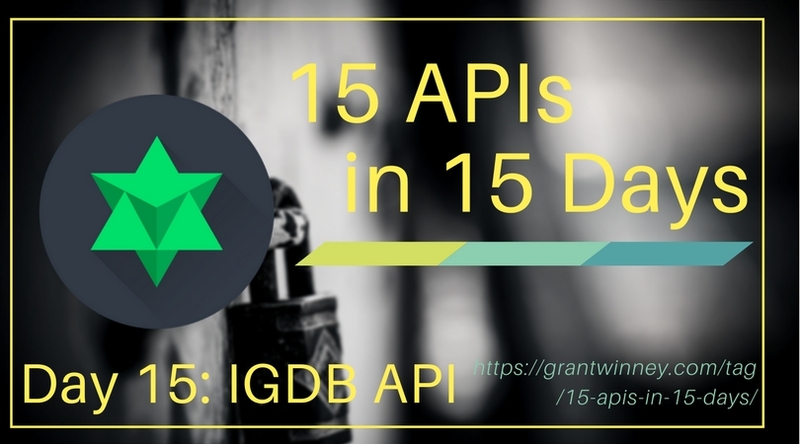 Wrapping up my search for 15 APIs in 15 Days (also on GitHub), the last API I'll write about is one I found completely at random - the IGDB API. The Internet Game Database (IGDB) is a community-driven site that collects and shares information about games and game-related data. You have to sign up for an account in order to get a key. Open the email they send, click on the link in it and login again, and note two pieces of information you'll need in order to make requests - the key (on the right), and the request url (on the left) that takes the form of https://api-<random-number>.apicast.io. Update (06/12/18): This process seems to have changed a little. Go to https://api.igdb.com/pricing and select "Get Started" under the Free plan. Register for a new account and click the confirmation link in the email, then login. Also, the request url no longer consists of a random number. It's just https://api-endpoint.igdb.com/ now. You can request games by keyword, limiting the results to just the ID and Name, so you can lookup more details later. "name": "Zelda II: The Adventure of Link"
"name": "The Legend of Zelda: Ancient Stone Tablets"
"name": "The Legend of Zelda: Four Swords Anniversary Edition"
"name": "The Legend of Zelda: Four Swords Adventures"
"name": "The Legend of Zelda: Majora's Mask Collector's Edition"
"name": "The Legend of Zelda: Link's Awakening DX"
"name": "The Legend of Zelda: A Link Between Worlds"
"name": "The Legend of Zelda: A Link to the Past"
"name": "The Legend of Zelda: Breath of the Wild - Expansion Pass"
"name": "duplicate The Legend of Zelda: Breath of the Wild Limited Edition"
And if you want to look up the details of a specific game, like "The Legend of Zelda: A Link to the Past", then just plug its ID into a request like this. You can use omit fields to get everything, but if you're only interested in a few pieces of data then you can also specify which fields you want. It's a nice API. You can read more about all the available endpoints - there seem to be quite a few others for looking up information about game developers, development companies, reviews, etc. If you find anything interesting yourself, let me know about it! I'd be interested in checking it out, or hearing about how you made good use of it. Good luck!